First attempt at double knitting! I am designing a new item, and decided it would be best in the reversible nature of double knitting. So… I had to learn double knitting. Yay, learning new things! 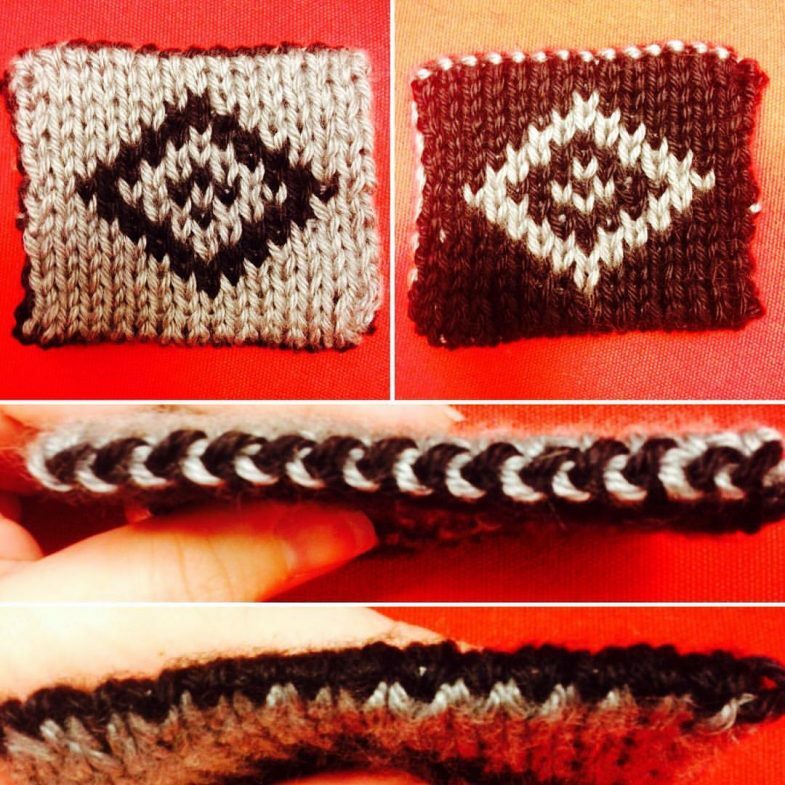 This swatch pattern is from the Craftsy course Adventures in Double Knitting. However, I did not use the cast-on taught in the course. Honestly, I was a bit confused by the cast-on as it was taught, so sought out further instruction online and stumbled upon this cast on I found to be both easier and more attractive! Tutorial by Knit Purl Hunter. I did the bind-off taught in the course, but I am not in love with it. According to my research, the best way to get that invisible bind-off (to match my cast-on) is to separate the stitches and Kitchener stitch them together. I am intrigued by this tutorial for a knit (not sewn) Kitchener stitch, so I will have to test it out later. There is also the Kitchener Stitch tutorial from Knit Purl Hunter, as well. I cast-on for the prototype of my new design last night. I tried to replicate the invisible cast-on that I achieved with the swatch, but for various reasons, it did not work out as attractively. I think a combination of factors: for the swatch, I used a larger needle for the CO, and there were less stitches, so they were able to all stay on the needle (as opposed to slipping onto the cable of the circular needle). Since I don’t have any longer needles (I rely pretty much solely on circular interchangeables), I cast on to one of my bamboo Tunisian crochet hooks, allowing the stitches to stay the correct diameter throughout the cast-on process. Results? Worked! Now to decide if I want to work the prototype (which often turns into the final project) in the Caron Simply Soft that I have laying around, or if I want to order new yarn. Seeing as Simply Soft is still a “commercially available” yarn, it will lend itself to being able to be published, but… it’s not really the best yarn (totally great for learning and some projects, still). Other yarns I am pondering include Knit Picks Mighty Stitch (80% Acrylic/20% Superwash Wool), SW Wool of the Andes (100% Superwash Wool), and Swish (100% Superwash Merino Wool). p.s. I ordered more yarn.